Penang's Wat Chaiyamangalaram (sometimes shortened to Wat Chaiya) is the most popular of Malaysia's Thai-style Buddhist temples. 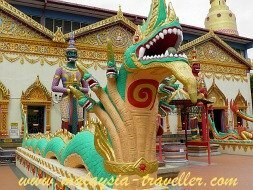 It is located in Lorong Burma just outside George Town's historic heritage zone. It is directly opposite theDhammikarama Burmese Temple making it convenient for tourists to cover both temples in a single visit. It is interesting to contrast and compare the different Thai and Burmese styles. 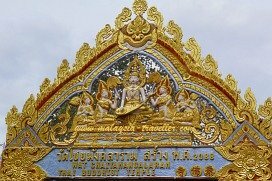 Wat Chaiyamangalaram was founded in 1845 by a Thai Buddhist monk. Over the years new buildings and attractions have been added. 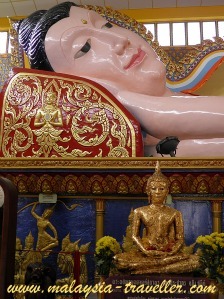 The temple's most famous feature is a 33 meter long (108 feet) Reclining Buddhastatue housed in the main shrine. When it was built in the late 1960s it was the largest reclining Buddha in Malaysia but has since been overtaken by Wat Photivihan, located near the Thai border in Kelantan, which has a 40 meter long statue. Even this one is a baby compared to the exquisite 66m long Chauk Htet Gyi Pagodain Yangon, Burma which I was fortunate enough to visit a couple of years ago. The world's largest reclining Buddha is near Monywa, also in Burma, and is 90 meters long. Like all reclining Buddha statues, Penang's one depicts Buddha on his death bed, lying on his right side with a blissful expression on his face as he prepares to enter Nirvana. His robe is gold plated and even his toe nails are painted in fine detail. The floor of the temple is decorated with lotus-patterned tiles. The walls of the shrine are lined with countless small Buddha statues and murals depicting events in Buddha's life painted by Thai artists. Niches behind the Reclining Buddha house funerary urns containing ashes together with photos of the deceased. More remains are stored in a separate columbarium building within the temple's compound. A large pagoda and other shrines can be found in the grounds. Some of these are built above symbolic round stones, known as loog nimit in Thai, which mark the original boundaries of the temple's area of ordination. 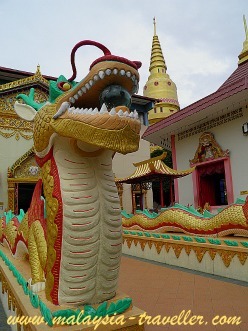 In front of the main building containing the Reclining Buddha are a pair of Thai style guardian statues, one with a red face and one green, as well as a pair of mythical creatures resembling giant serpents and dragons. The temple is opened daily from 6am - 5:30pm. Admission is free. Collection boxes are dotted about if you want to leave a donation. You have to leave your shoes outside the main shrine before entering. There is a sign saying 'Beware of Shoe Thieves'. My shoes are so tatty there is no danger of them being stolen! 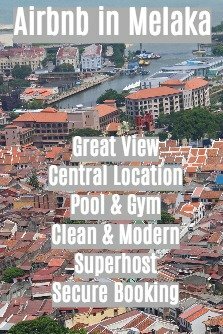 The exact location is marked on the map on my Top Penang Attractions page. 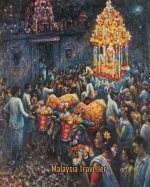 Want to understand more about Thai Buddhism? This website, written by a non-Thai, seems quite authoritative for the novice.